Pick Analysis: Donnerson was a two-time all-state pick in Arkansas before matriculating to Southeast. He played in every game as a true freshman (nine tackles, two for loss, sack) and became a more regular contributor the following season (32 tackles, two forced fumbles). Donnerson became a starter at outside linebacker in 2016 (10 of 11 games played), posting 50 tackles and leading the squad with 13 tackles for loss, four of which were sacks. His senior year was his best, earning first-team All-Ohio Vally Conference honors with 53 stops, 13.5 for loss, six sacks, an interception, three pass breakups, and three forced fumbles. 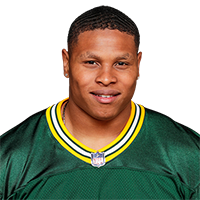 Published: April 28, 2018 at 06:42 p.m.
Marriott Winner Clifford Yow announces the Green Bay Packers select Southeast Missouri State linebacker Kendall Donnerson No. 248 overall in the 2018 NFL Draft.